Using an image from the very first episode. 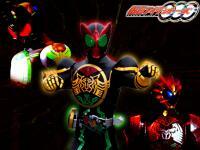 Kamen Rider Double....Ore-tachi Sanjou! Sorry to all the Den-O haters out there. I just couldn't resist. The other image of Double on his bike came from another website during a lucky image hunting session on Google. Can you e-mail those to me so I can add them to my Wallpaper collection please??? Are you unable to save them right from the site at the moment? I right click and I get "Back" & other stuff. Likewise with the rough sketches of Sea Wing & Sea Wolf. Hmm....strange. Ok, I'll go through my files tonight and send ya an email later this evening. Ok, I just sent the email a moment ago. Let me know if it got through with the files attached. By the way, my friend Bethany is now a Rider fan. She's who I named OK's girlfriend after. I remember you telling me that some time ago....can't remember when. It just happened this past Monday. You're thinking of another female friend of mine. Thanks to Ryuki for providing all of the Rider stock images used in this wallpaper. The only thing not provided is the basic background look and the Earth image (those were all done in PS). This isn't my best wallpaper but I just wanted to do a Rider collage of all the Rider worlds Decade has visited, minus the Shikenger World, W's World and G's world in the SMAP presentation. do you want the images of earth from the website? I didn't include them in the archive because i didn't foresee anyone wanting them. well not for myself. But Spectre and I could use the Earth image for the Decade fanfic world map. So please, by all means, if you wouldn't mind. ok, yeap I got all those images and am uploading them. some nice earth images. 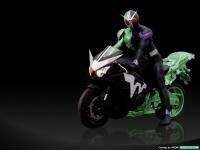 I included the semi transparent rider forms too and the stylised symbols. check the decade images thread. Sweet wallpaper!!! Could you e-mail that to me??? I use a quick snapshot from the opening sequence of episode 12. I chose to use the part of Philips henshin sequence where the spikes just out for the setting moment before smoothing out. I wanted it to look more fearsom in a way. Enjoy. this is also our 4th KR W wallpaper. Now, let us count your crimes. Very cool Wallpaper. Could you e-mail that & the Decade one to me??? I can't download them for some reason. Two cool wallapers could be these: 1) Kamen Rider Double in all nine forms with the Gaia Memory Symbols floating next to them. 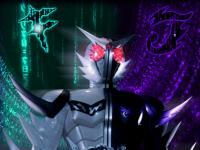 2) The Sonozaki Family in their Dopant forms with their Gaia Memories floating above their heads. I can easily email it to ya. Which Decade one did ya want? I've made a few of them last time I recall. As for those Double ideas.....they sound interesting. I can easily do ones for the forms of Double. 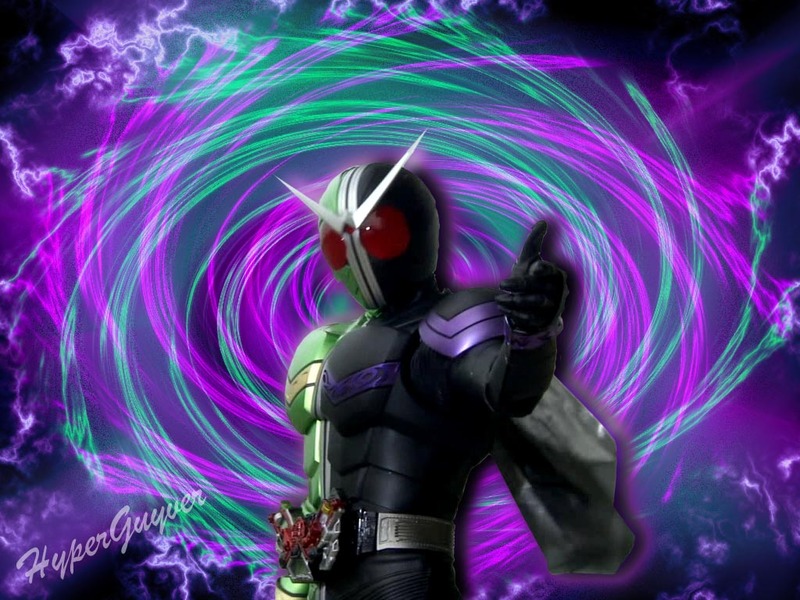 I'd have to make CYCLONE-JOKER, CYCLONE-METAL, CYCLONE-TRIGGER, HEAT-JOKER, HEAT-METAL, HEAT-TRIGGER, LUNA-JOKER, LUNA-METAL, LUNA-TRIGGER, FANG-METAL and FANG-TRIGGER (the last two, the FANG sets, would have to wait as only images of FANG-JOKER are slightly available. as for the Sonozaki family, I can do seperate WP's and a group set. AS for their GM symbols and those for W, PS is my friend and so is VLC and Media Player Classic. If I were to do a WP with all of W's current forms, I'd need images in the area of 12 forms. 10 of which I can get. I'd make the symbols personally as I like doing it that way. But it's something to plan ahead. For now, this one was made on a whim. Well, again, let me know which Decade WP you were wanting and then I can e-mail both WP's to ya. The Decade at the top of this page. 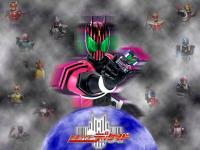 I have pictures of all nine of Double's forms. Ah, ok. I'll e-mail them ASAP. AS for the W images, I prefer stock images from snapshots when making WP's. apparently there is a fix coming to allow images to be saved again. 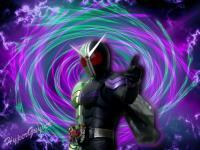 In celebration of the newest upcoming Heisei Rider. Now, it's not the best as the images used were kinda grainy but I did what I could. Enjoy. i might change my mind (a little) about this new series based on your work.